Spinach Artichoke Dip is an oldie but goodie! 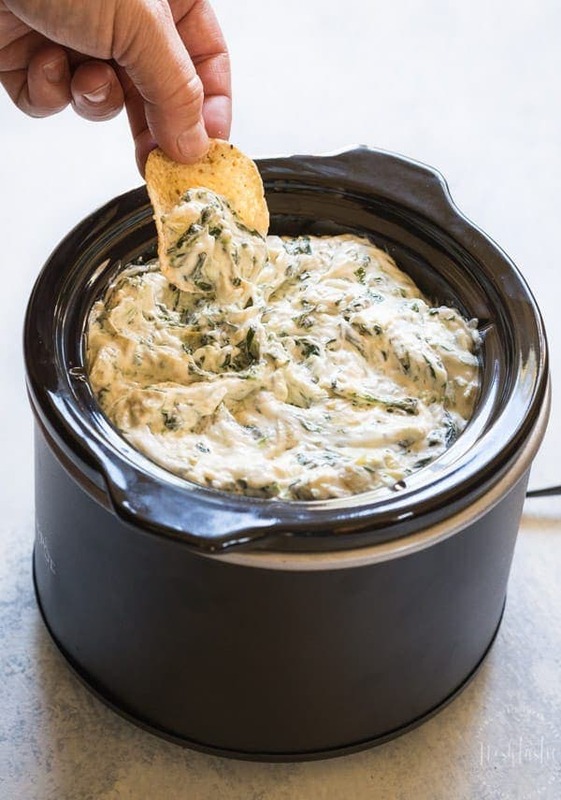 Full of cheesy goodness and stuffed with healthy spinach and artichoke hearts, this really is a dip you can feel good about! There’s no mayo in my spinach artichoke dip, instead I’ve added a little milk and some sour cream to create a smooth rich texture. We also have a mix of three kinds of cheese including cream cheese, parmesan and a little mozzarella to get that lovely stretchy cheese thing going on! 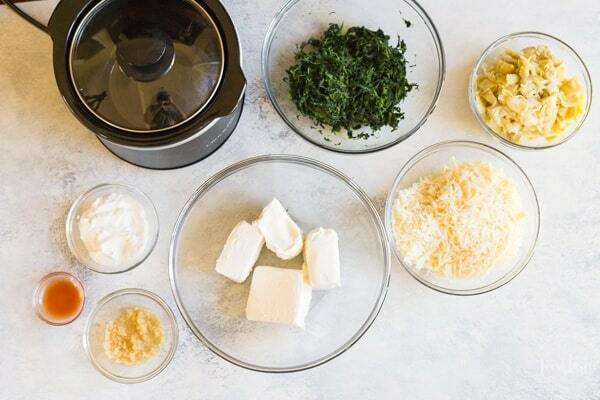 You’ll see all the ingredients you’ll need for my spinach artichoke dip in the photo below, they include sour cream, three cheeses, chopped spinach, artichoke hearts, and some hot sauce for good measure! The full recipe list is at the end of the post. 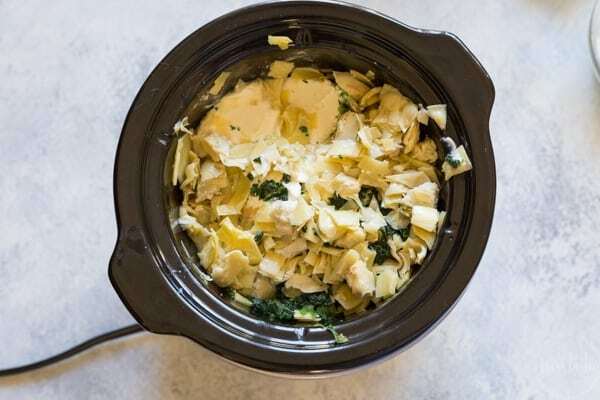 A couple of quick tips before you get started on your Spinach Artichoke Dip, do make sure you fully drain the frozen spinach and squeeze it dry before you add it to the crockpot as this will help prevent the dip from being watery. 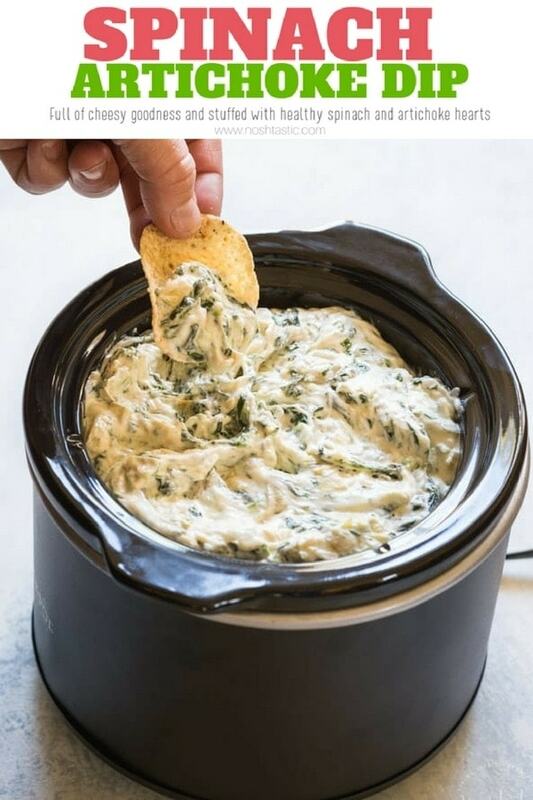 I used the ‘Little Dipper’ crockpot that is a perfect size for serving dips like this from as it cooks it and then keeps it warm perfectly so that you can serve it to a crowd at your next party or family gathering. 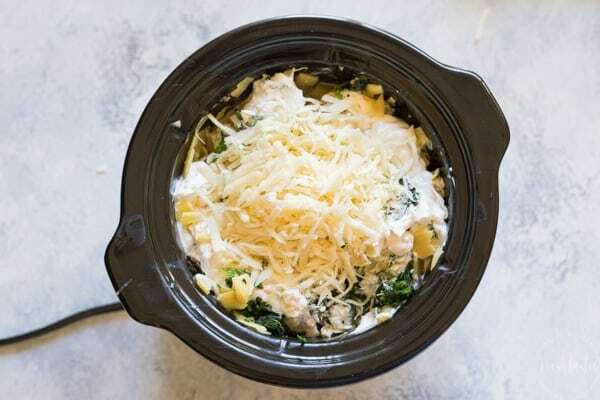 If you find that all the ingredients won’t fit in your small crockpot at first, simply wait until some of the cheese has melted down and then add the rest and stir it well in. Another option is to bake this dip in the oven, if you want to do that simply mix all ingredients as directed, and place into an oven proof dish and bake for 20-30 minutes or until it starts to bubble a little round the edges. 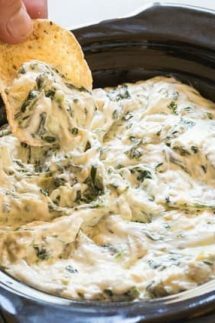 Spinach Artichoke Dip that you can throw together really quickly into your crockpot or slow cooker, it's great for game day, or any day! Chop the artichoke hearts into small pieces, and then drain the defrosted frozen spinach and squeeze it dry. Add all the ingredients to a small crockpot, I used the little dipper Crockpot, and turn it on for 30 minutes to 2 hours, or until all the cheese has melted. You may need to wait until some of the cheese melts down to add all ingredients if you use the little dipper crockpot, but it should all fit once it melts. Mix the ingredients as directed above. Add the spinach artichoke dip mix to an oven proof dish and bake at 350F for 20-30 minutes or until all the cheese has melted and it's hot all the way through.